Why do vaccines start so early? Young children—even newborns—begin vaccinations early in life to protect them from serious and deadly diseases that can infect them at a very young age. The effects of these diseases can be very serious, and even life-threatening, for infants and young children who are not protected by vaccination. A child receives a vaccine based on decades of medical science that shows when the infant is likely to be most susceptible to the diseases and also when the infant will produce the best immune response to a vaccine. An infant’s immune system is not fully developed until he or she is about six months old. Their immune systems are more vulnerable to infections and diseases than adults. Babies do receive antibodies from their mothers, and the antibodies are shared through the placenta during the last 1-2 months of pregnancy. As a result, newborn babies are immune to some diseases, but this immunity lasts only a few months. Also, most babies do not get protective antibodies against diphtheria, whooping cough, polio, tetanus, hepatitis B, or Hib from their mothers. This is why it’s so important to vaccinate babies before they are exposed to a disease. Through vaccination, infants will start to produce antibodies with each vaccine dose. Most vaccine series are started when babies reach two months old because this is when the high level of antibodies passed on by the mother begins to decline. With the decline in protection, it’s important to start the vaccine series to ensure babies are protected from disease. 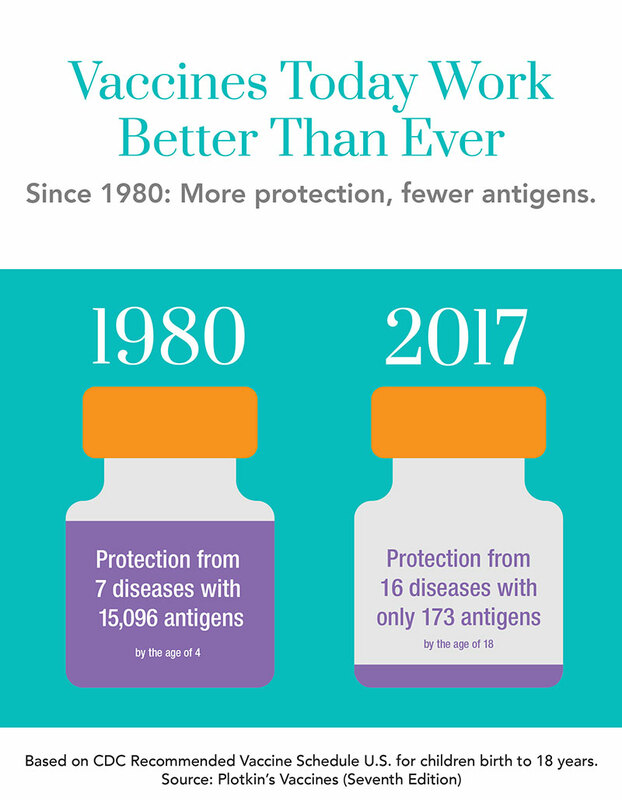 Before 1985, the recommended immunization schedule included only seven vaccines and covered only seven diseases. The good news is that today, vaccines can protect children and teens from 16 potentially serious diseases. Every day, a healthy child’s immune system successfully fights off thousands of antigens—the parts of germs that cause the body’s immune system to go to work. Vaccines contain only a tiny fraction of the antigens that children encounter every day in their environment, even if they receive several vaccines on one day. American Academy of Pediatrics: Do Multiple Vaccines Overwhelm or Weaken the Infant’s Immune System?